Visualization 2006 will be held at the Hyatt Regency in Baltimore, Maryland October 29 - November 3, 2006 (special Vis 2006 rate: $169 per single/double room). Reservations are being accepted now. Click here to make your reservation. 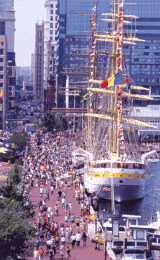 The conference hotel is located in the heart of Baltimore's Inner Harbor district. This has been one of the oldest seaports in the United States tracing its beginnings to 1700s. Over the last decade it has experienced resurgence as the cultural center of the City. Some of the attractions in the immediate vicinity of the conference hotel include, the National Aquarium in Baltimore, the Maryland Science Center, the Fort McHenry National Monument, and the Baltimore Maritime Museum. An extensive array of shopping and dining options are available at the Harborplace and the Power Plant. The Harborplace includes two glass enclosed pavilions with 30 informal eateries and over a dozen restaurants, accessible via a direct skyway from the conference hotel. The nearest airport to the conference venue is the Baltimore Washington International (BWI) Airport. The Light Rail from the airport brings you to within a 15-minute walking distance of the conference hotel (get off at the Convention Center stop). 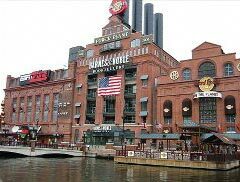 Other points of interest in the Baltimore downtown include the Camden Yards (home of the Baltimore Orioles), M & T Bank Stadium (home of the Baltimore Ravens), Port Discovery, the Baltimore Museum of Art, the Batlimore and Ohio Railroad Museum, and the Baltimore Civil War Museum. For further details about the rich and vibrant history and happenings in Baltimore visit www.baltimore.org and refer to the comprehensive guide of attractions. Photos are courtesy of the Baltimore Area Convention and Visitors Association.